Hiking the Sierra Nevada and climbing Mulhacén in September 2001was a fantastic Spanish late summer adventure. We will never forget. After spending half an hour on the 3482 m peak, still full of joy and adrenaline we descended fast, hoping for the rewarding refreshing shower and a paella. However, in the first pueblo we immediately saw something was wrong. Some strange TV images in the local pub later turned out to be “SEPTEMBER 11”. Mulhacén is the highest mountain in continental Spain (second after Pico de Teide / Tenerife). It stands at 3,482m in the Sierra Nevada. 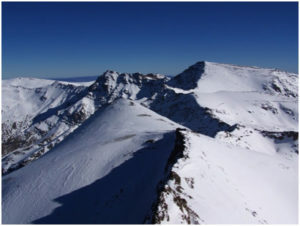 The National Park of Sierra Nevada and reserve of the Biosphere by UNESCO has 171,643 hectares and its maximum height, the Mulhacén, is the ceiling of the Iberian Peninsula. Mulhacén takes its name from Muley Hassan, father of Boabdil, who was buried at the foot of this impressive mountain. From the top, you can see on a clear day, Africa to the south with the shimmering Mediterranean in the fore, and in every other direction, the land dips away to reveal the marvels of the Sierra Nevada mountain range and the whole of the Province of Andalucía.